There’s more to just writing and rehearsing your pitch in Pitcherific. The pitching scene is currently evolving and more places than ever are requesting a video recorded version of your pitch, or “video pitches” as they are often called. 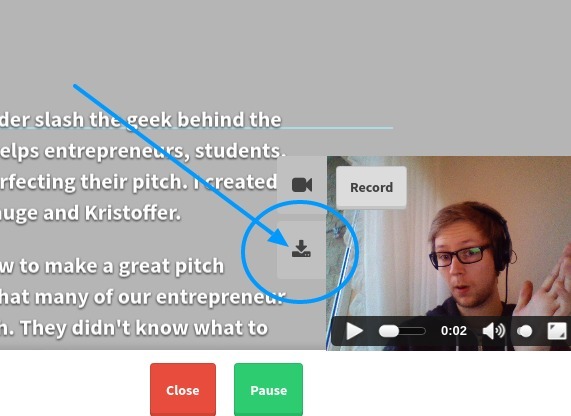 To help you with this, we’ve added a video recorder straight inside your teleprompter using your built-in webcam and microphone to make it easier for you to record a video pitch and have your pitch manuscript rolling in front of you at the same time. Alright, so you’ve got a nice video recording of your winner pitch. Great! Next step is to download it as a file. You do this by clicking the download icon just below the video pitch recorder icon. This will download your pitch as a .webm file, which you can then preview on your computer. Usually, you would convert it to either .mkv or .mp4, but it depends on your situation. If you need to convert your file, as you will have to if you’re using Chrome (read below), we recommend an app like Handbrake. It’s free and super easy to use. There’s no sound when downloading from Chrome! Since we use some pretty new technology for recording and creating video pitches, not all browsers can keep up (yet). For Chrome version 49, you can record and download your video, but when you open the .webm file you will notice that the sound doesn’t play. This doesn’t mean that there’s no audio! All you have to do is convert the .webm file to .mp4 or .mkv and it will play just fine. In future versions of Chrome this will be fixed and we know the awesome engineers over at Google are working hard to fix this. If you don’t want to convert your file, then we recommend that you use Firefox instead.